Young Jon Kent has superpowers but his wavering levels of invulnerability worry parents Lois and Clark. They take him to the Fortress of Solitude, intending to run tests using Kryptonian tech, but come across some Kryptonian tech they'd not bargained on. The Eradicator? Well, an Eradicator from some version of Krypton. Originally a robot cop serving General Zod, its prime mission went from tracking and eradicating evil to finding the inhabitant of the rocket it saw leaving Krypton as the planet exploded. It never managed that, that Kal-El is dead, but here's the Kal-El from another universe and his super-powered son. Who, sadly, from his point of view, is but a half-breed. He's trying to eat Jon, to eradicate his human side. Luckily the Eradicator wasn't the only unexpected being in the Fortress. It's Krypto! All cute and cuddly! I don't think he's dead, I expect the Eradicator's mouth is a portal to the Phantom Zone and the Kryptonian Canine will be back to save the day. After all, we know the Eradicator was planning to purify, not remove. But what is it with writers Peter J Tomasi and Patrick Gleason and pets? In the first issue of this series Jon accidentally fried the family cat. And here, the Dog of Steel gets eaten. In the Silver Age there'd be stories such as How Wonder Woman Got Her Tiara or How Aquaman Got His Trident and the answer would be something sweet involving rites of passage, maybe a lost race or an old god. 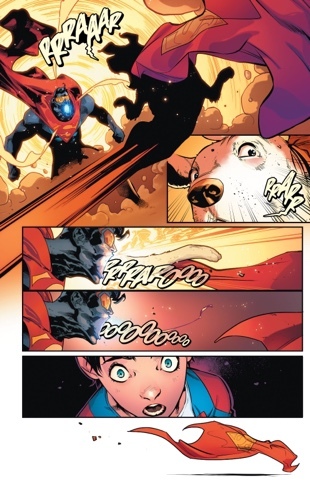 The answer to How Superboy Got His Cape should not be: 'He picked it up off the floor after a loyal puppy got swallowed by a eugenics-happy monster.' 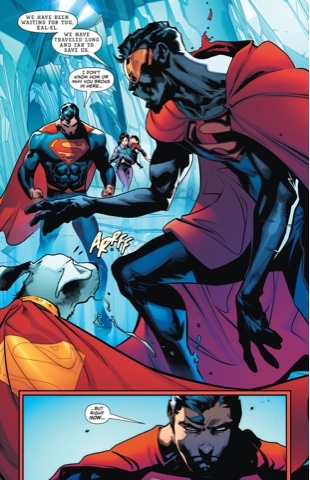 Again, it's nigh certain Krypto will be back to be Jon's new pet, but for now, Jon's anguish is real. And enough with the Eradicator. 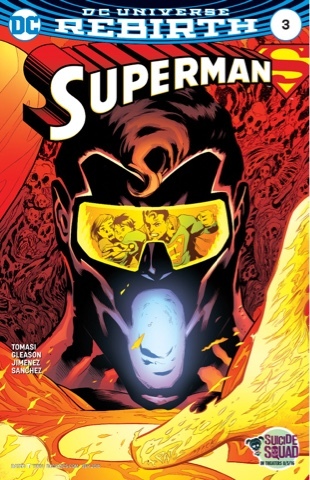 Obviously, all the Superman books are riffing on the Nineties Reign of the Superman story, so someone had to get the Eradicator, but I hope he speedily exits and stays away. I get that he represents Superman's possible desire to revive his dead world, but at base he's simply a Very Stern Robot. Jorge Jimenez really nails the big moments, whether it's the brutal fight with the Eradicator, the entity's past on Krypton and beyond as a ruthlessly logical killer or Jon's anger and determination. And he gives Lois a quiet beauty seldom seen in comics. The flashback framing is superb, while the tweaked Eradicator design, with him a little more gnarled than in previous days, is unsettling. 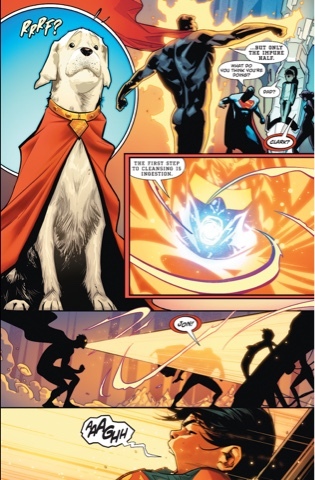 And Krypto actually looks like a dog, complete with dirty, hairy coat. Colouring Jimenez, Alejandro Sánchez keeps the pages at boiling point - the Eradicator effects are especially good - while letterer Rob Leigh gives the being a distinct font. I don't like it, but it's distinct. Gleason pencils, Mick Gray inks and John Kalisz colours the cover and it's almost very effective; the skulls, though, are too much - a plain background would have allowed the Eradicator's creepiness to pop, rather than get lost a tad. Kenneth Rocafort's beautifully balanced and executed variant image needs to be a t-shirt, now. 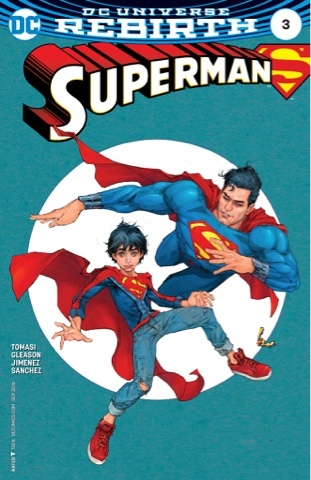 Another well-crafted issue, like the debut number, Superman #3 suffers from dialling the shocks up too far - this isn't just a Superman comic, it's Superman and Family and unless 'family' equates to 'The Addamses', the tone should reflect that. Such marvellous word coinage, you're a regular Neologismanderthal! And with that, I'm no longer buying "Superman." It seems to me that DC has tried to fix the error of dictating Clark not be married or with (or at least pursuing) Lois (what was up with that?) by veering too far in the other direction with this Lois married to Clark with super-kid angle...I don't understand why they don't just go with tried-and-true Clark likes Lois but Lois likes Superman. That'll likely be the next go-round. I'm ready for that. Oh for different books across different continuities. Jon Kent looks like Akira in that last shot. Tomasi just can't write his Superboy unless he's grief stricken. Is that not more of an art thing? I would like to give the benefit of the doubt, but where Jurgens has Jon as a vibrant youth, Tomasi has him as a bird killer. I hated the scene, but I have to note that he was hardly a deliberate avian assassin! It's certainly a better way to realize that finality of death than killing three Phantom Zone criminals.